These terraced houses are large, with well-kept interiors and some of them have a first floor. The houses have a terrace or a loggia and a large open garden with furniture. The two-bedroom house (FR-02220-01) is suitable for up to four people; the three-bedroom house (FR-02231-01) is suitable for up to six people; the four-bedroom house (FR-02232-01) is suitable for a maximum of eight people, and the five-bedroom house (FR-02233-01) is suitable for up to ten people. The latter house lies on in the Les Hauts du Lac part. Houses FR-02220-01, FR-02231-01, and FR-02232-01 may also be situated in the Les Hauts du Lac area. You can park your car on the central parking spaces nearby the house. 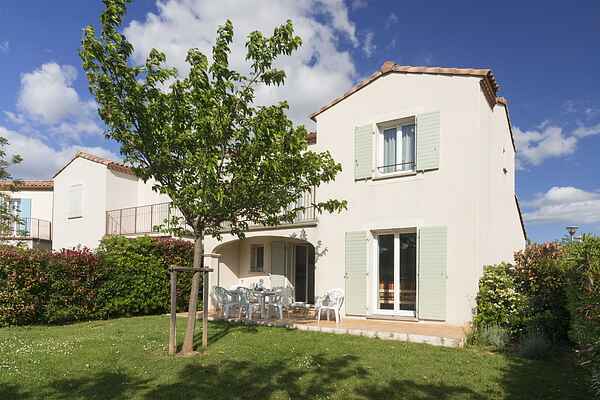 The partly terraced villas lie in the quiet part of Les Hauts du Lac and offer a beautiful view across the lake. The spacious, beautifully decorated villas have a first floor and have a terrace and a loggia and a fenced off garden with a private pool (7 x 3.5 m). There is a 4-bedroom villa for up to eight people (FR-02234-01) and a 5-bedroom villa for a maximum of ten people (FR-02235-01). You can park your car in front of the villa.